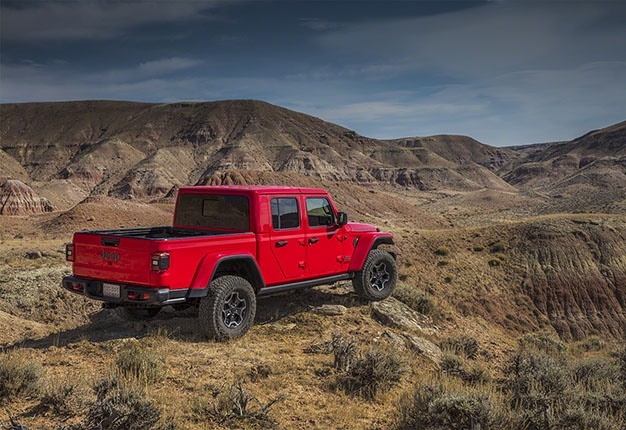 The all-new 2020 Jeep Gladiator – the most capable mid-size truck ever – builds on a rich heritage of tough, dependable Jeep trucks with an unmatched combination of rugged utility, authentic Jeep design, open-air freedom, clever functionality and versatility. Not to mention best-in-class towing and 4x4 payload, advanced fuel-efficient powertrains, superior on- and off-road dynamics and a host of innovative safety and advanced technology features. 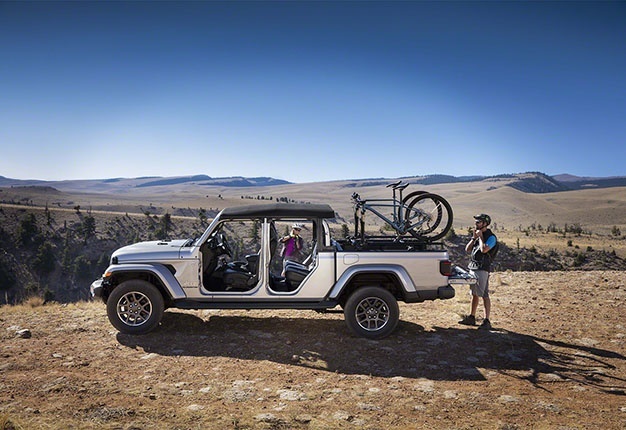 "Unquestionably a truck and instantly recognizable as a Jeep, the all-new 2020 Gladiator is the ultimate vehicle for any outdoor adventure," said Tim Kuniskis, Head of Jeep Brand - North America. 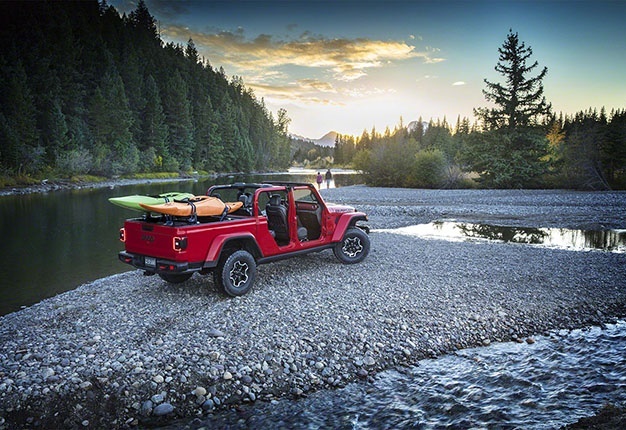 "There is tremendous demand for this unique vehicle from our loyal Jeep customers and pickup truck buyers everywhere. Born from a rich and proud heritage of tough, dependable Jeep trucks, Gladiator combines rugged utility, versatility and functionality resulting in the most capable mid-size truck ever," Kuniskis added. The Gladiator delivers unmatched capability with best-in-class towing and 4x4 payload capacity, composed on-road driving dynamics and passenger safety. Legendary off-road capability comes courtesy of the Command-Trac and Rock-Trac 4x4 systems, third-generation Dana 44 axles, Tru-Lock electric front- and rear-axle lockers, Trac-Lok limited-slip differential, segment-exclusive sway-bar disconnect and 33" off-road tyres. 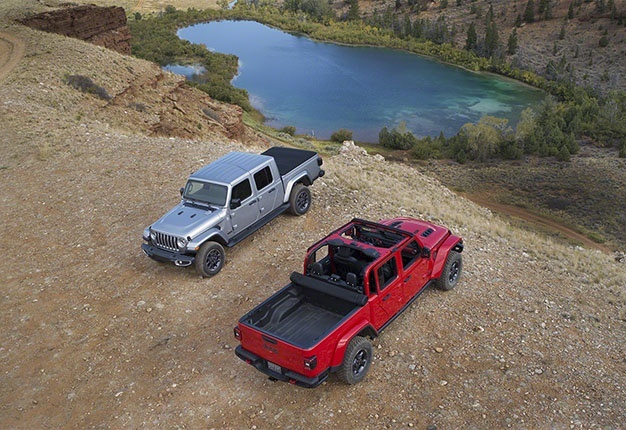 The 2020 Jeep Gladiator is available in these different trim configurations: Sport, Sport S, Overland and Rubicon. 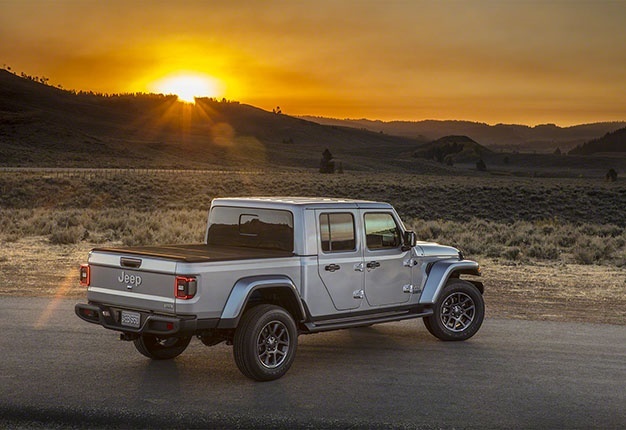 Built in Toledo, Ohio, the all-new 2020 Jeep Gladiator arrives in US showrooms in the second quarter of 2019. The Gladiator boasts a rugged, distinguished design aesthetic that is immediately recognizable with traditional Jeep design cues. Gladiator Overland and Rubicon models offer available LED headlamps and fog lamps that project crisp white lighting, adding to the truck’s modern look. Gladiator models are equipped with LEDs featuring daytime running lights, which form a halo around the outside perimeter of the headlights. Forward turn signals are positioned on the front of the trapezoidal wheel flares. The full-size spare tyre and mount is located under the bed, behind the rear axle, and capable of holding up to a 35" tyre. An available spray-in bed liner, bed divider and tonneau cover provide even more options to keep cargo secure while helping with durability. Gladiator Rubicon models are equipped with protective cab and cargo bedrock rails. A four-bolt design at the top of the windscreen’s frame allows for the windscreen to fold down quickly and easily. A header bar connects the A-pillars and stays in place even when the windscreen is folded down. This allows the rearview mirror to remain in place even with the windscreen folded. Two-piece body-colour fender flares with a black lower insert give a raised profile and are standard on Overland and available on Rubicon models. Lightweight, high-strength aluminium doors feature the Torx bit size stamped directly onto the hinge to eliminate guessing which size bit is needed to remove the doors. A toolkit with the necessary Torx bits to remove the doors and lower the windscreen is provided as standard equipment. All Gladiators feature body-coloured sports bars, which are welded to the body and feature integrated grab handles for front occupants. Gladiator Overland and Rubicon models share an available three-piece body-colour hardtop option, offering a unique, premium appearance, while a black three-piece hardtop, available on all models, offers even more options for open-air driving. The two Freedom panels and quick-release latches enable a fast removal and installation of the hardtop. All hardtops feature a manual rear-sliding window. The Gladiator’s interior combines authentic styling, versatility, comfort and intuitive feature use. Precision craftsmanship and high-quality materials are found throughout the cabin. The heritage-inspired centre stack features a clean, sculpted form that complements the horizontal dashboard design and sports a finish dictated by the model choice. A hand-wrapped instrument panel features a soft-touch surface with accent stitching on Gladiator Overland and available on Rubicon models. Functional features, including climate and volume control knobs, media charging and connectivity ports, and Engine Stop-Start (ESS) control are all sculpted for quick recognition and are easily within reach of the front-seat occupants. Inboard and outboard circular HVAC vents are surrounded by a platinum chrome bezel for a precise and premium yet rugged appearance with full functionality. The rear seat cushions can fold up into "stadium" position to reveal a standard open storage bin, which utilizes the space under the seat for storing miscellaneous items. An optional lockable bin provides secure storage space when the top or doors are removed. The available lockable storage bin features two different size doors that correspond to the 60/40 split rear seat cushion. Removable dividers can provide up to five separate compartments and uses the same lock as the glove box and centre console. The instrument cluster features a 3.5 or an available 7" thin-film transistor (TFT) information LED display. The 7" LED display allows the driver to configure information in more than 100 ways, including current media being played, tyre pressure, tyre-fill alert, or digital speed readout. Integrated buttons on the steering wheel control audio, voice, and speed functions and allowing the driver to keep their hands on the wheel at all times. A 7.0 or an available 8.4" touchscreen houses the fourth-generation Uconnect system and sits prominently on top of the centre stack. The fourth-generation Uconnect system enhances the user interface and system performance with quicker startup times and improved screen resolution. A 5" touchscreen is standard on Gladiator Sport. Directly below the touchscreen are functional features such as climate and volume control knobs and media connectivity ports. Two USB ports and a USB-C port up front and two in reach of occupants in the back seat connect to the media centre. A 115V AC outlet is available to power select three-pronged home electronics. The Gladiator offers the proven 3.6 litre Pentastar V6 engine at launch with a 3.0-litre EcoDiesel V6 engine being offered in 2020. The 3.6 litre Pentastar V6 engine delivers 209kW and 260Nm of torque and features Engine Stop-Start (ESS) as standard. It is engineered to provide a broad torque band with a focus on low-end torque – an essential trait needed for extreme off-roading. A six-speed manual transmission is standard on all Gladiator models equipped with the Pentastar V6, and an eight-speed automatic transmission is optional. Known for its refinement, power, efficiency, and adaptability, the Company has produced more than 8.6 million V6 Pentastar engines since production began in 2010. It benefits from the popular V6 engine’s low-range torque, which is needed when out on the trails or during demanding conditions such as hauling cargo or towing a trailer. Gladiator models will offer the EcoDiesel V6 engine, rated at 183kW and 442Nm of torque, with Engine Stop-Start (ESS) standard. An eight-speed automatic transmission is standard and is designed to handle the increased torque output. It will be available starting in 2020. The EcoDiesel V6 engine implements refined turbocharger technology with a low-friction bearing designed for low-end and transient performance. The Gladiator offers an eight-speed automatic transmission, enabling the vehicle to optimize engine output while on the trails or enjoying smooth, efficient power delivery at highway speeds. 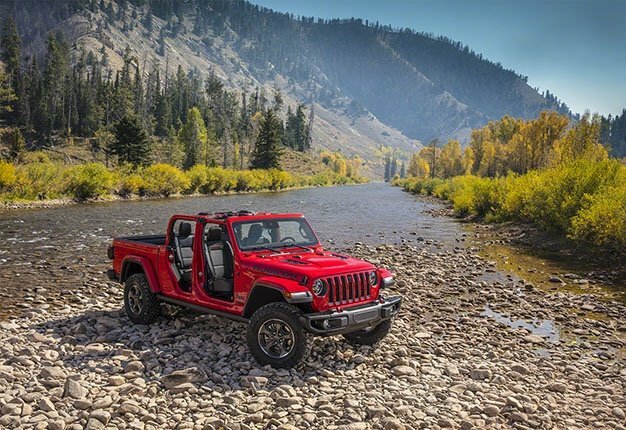 The eight-speed automatic is available on all Jeep Gladiator models. All Gladiator models are equipped with the standard six-speed manual transmission. This transmission features a unique design that employs optimized gear ratios for bolstered crawl ratio performance and is cable-operated, eliminating shifter vibration and bolstering sound isolation. The Gladiator delivers legendary off-road capability courtesy of two advanced 4x4 systems. Both Command-Trac and Rock-Trac systems offer full-time torque management, enabling optimal grip in low-traction conditions. Gladiator Sport, Overland and Rubicon models receive a Trail Rated badge thanks to legendary Jeep 4x4 capability. It utilizes a variety of ways to optimize ride, handling and sound characteristics while bolstering fuel economy even while towing and hauling. 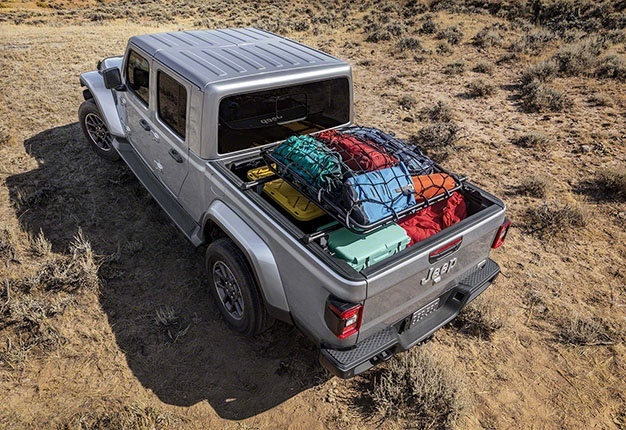 Utilizing a body-on-frame design and featuring a superbly engineered five-link suspension system, Gladiator delivers on capability, with composed on-road driving dynamics, passenger safety and best-in-class towing and 4x4 payload capacity. The springs have been tuned for an optimum balance between on-road handling while providing a comfortable ride around town, with or without cargo in the bed, and legendary off-road capability. Ride comfort, body-roll control, handling, payload and towing capability is significantly enhanced with assistance from shock tuning, hardpoints, and body mount strategy. Gladiator also benefits from up to 30" of water fording, up to 725kg of payload and up to 3 469kg of towing capacity with the available Max Towing Package. Safety and security were paramount in the development of the Gladiator, which offers more than 80 available active and passive safety and security features. Available features include Blind-spot Monitoring and Rear Cross Path detection and forward-facing off-road camera, standard ParkView rear backup camera with dynamic grid lines, Adaptive Cruise Control, and electronic stability control (ESC) with electronic roll mitigation. It also offers three Uconnect systems – Uconnect 5-, 7" and 8.4NAV, delivering communication, entertainment and navigation features drivers and passengers desire, including a full-colour LED instrument cluster. The Gladiator is available with the Uconnect 7.0 or 8.4NAV systems and includes the new Apple CarPlay and Android Auto features. Apple CarPlaySeamlessly integrates an iPhone with the vehicle’s built-in display and controls in addition to featuring Siri Voice control. iPhone-equipped drivers can make phone calls, access music, send and receive messages, and receive voice-guided navigation optimized for traffic conditions and more while staying focused on the road. Android AutoThe system shares useful information when driving and makes it easy to access the best of Google technology. Featuring Google Maps with free voice-guided navigation, live traffic information, lane guidance, and on-demand access to 30 million songs with Google Play Music, plus the ability to place phone calls or send and receive messages while keeping hands on the wheel and ask Google search any question. Android Auto also makes it easy to access popular apps and content from the Uconnect system’s touchscreen.